Arne Bystrom is one of the premier jugglers in the Pacific Northwest. 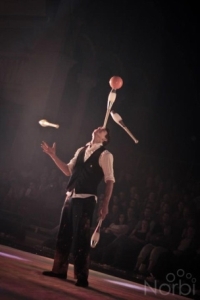 Arne performed in productions in Quebec City, Chile, toured New England with Circus Smirkus, and performed for a variety of clients in the Seattle area. A graduate of l’Ecole de Cirque in Quebec, Arne also coaches at the School of Acrobatics and New Circus Arts in Seattle, Wa.